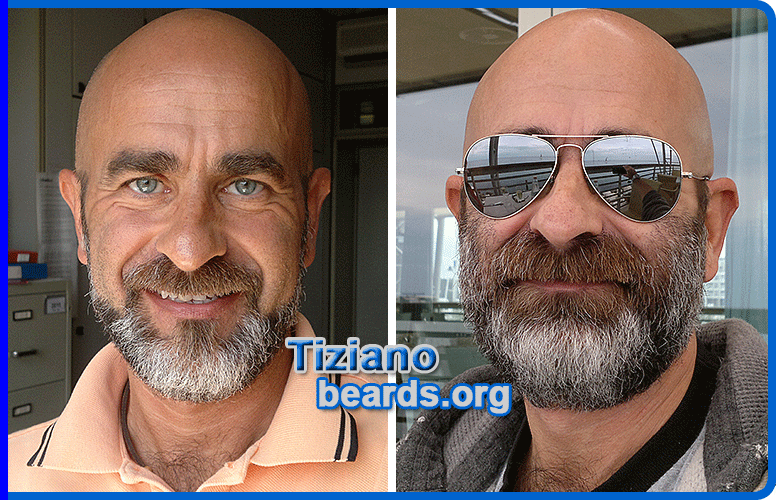 All about beards is happy and proud to present Tiziano in our featured beards section! 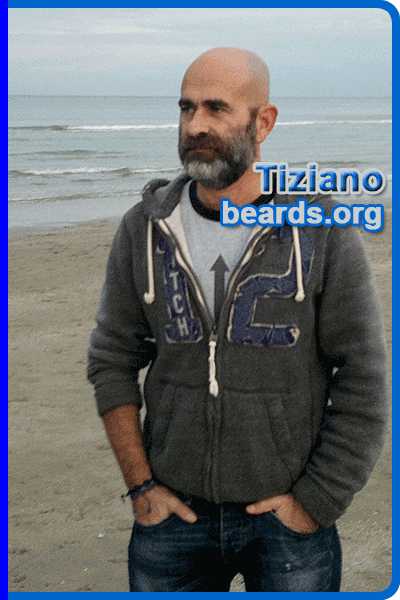 Not long ago, Tiziano discovered the joy of beard and is now fully dedicated. 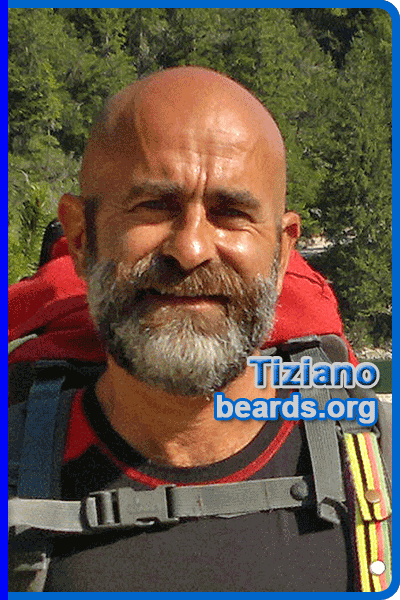 Tiziano comes to us from northern Italy where he is an avid outdoorsman who enjoys sailing, swimming, running, and trekking in the mountains. He is also an amateur radio operator and volunteer for citizen protection efforts, working with authorities to assist with providing communications during emergencies such as floods or earthquakes. 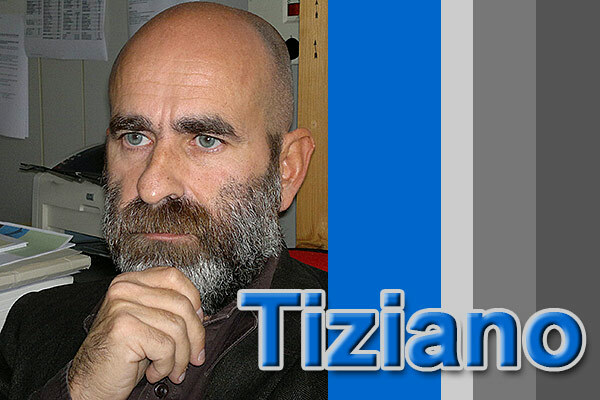 Tiziano is a health professional and master in health management. He stays very busy working in public health and teaching at the university. He is also active in his professional association, performing work for the association in addition to his full-time job. Further, he is part of a professional group that works to spread a way of working, the “community of professional practice”. I love the sea, seeing it from the land or out on it, on a sailboat. In summertime I love getting a tan. Now that I’m wearing the full beard, tanning is much better than before. Sometimes I like to drive for miles in my car, listening to music in the background. That relaxes me a lot. I’ve been married since 2006, but partnered since 2002, with my great wife Lisa. 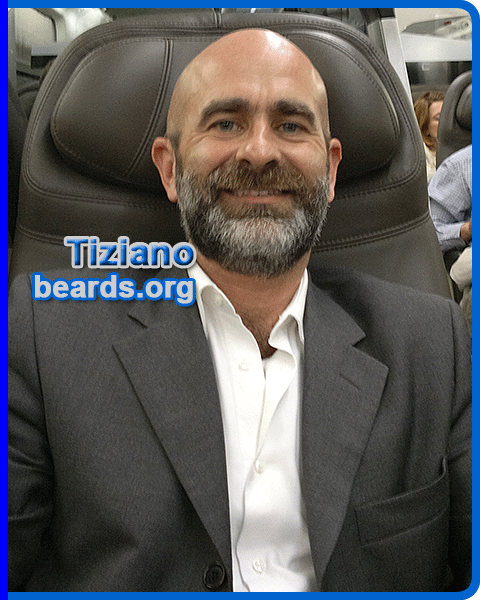 Now scroll on down to read Tiziano’s beard story. Then, be sure to visit Tiziano’s photo album. 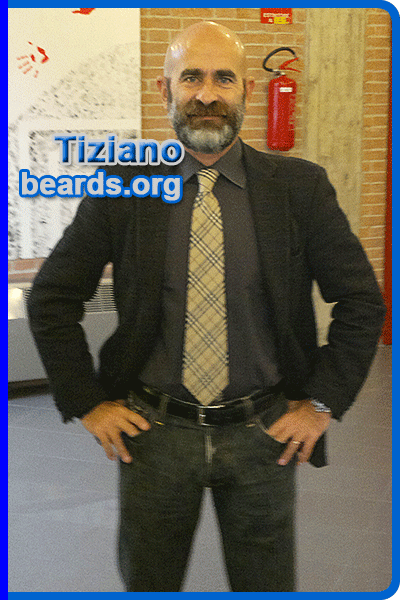 The photos on this page and in Tiziano’s photo album are courtesy of Tiziano and are used with permission. All photos are subject to the site’s conditions of use. I think the beard is a way to show the expression of your own nature, even if sometimes a beard is grown to hide something. Usually when I see a bearded man, I think he has personality and bravery. What do you think a beard says about a man? A beard is a personal statement to the world. How are beards viewed today in Italy? Currently beards are well seen. The beard makes fashion. In show business and in the sporting world, a beard is often worn by men of success. Do you know of anyone in your family having a beard before you? Actually I can’t recall anyone in my family having a beard. Where I grew up in Italy, I don’t recall anyone in my neighborhood having a beard, except a man who was in a next door family. I remember him as a creative man. He was a young musician. Do you remember your first awareness of beards? In my childhood I saw men with beards, but I do not remember what I thought. I can only say that I remember men with beards appearing more masculine and self confident. I grew my first beard in 2011 during the frequency of the university for a doctorate. Did you ever grow a beard before 2011? Did you ever think about growing a beard before 2011? What led you to your decision to grow your first beard? I don’t know. A light bulb came on and I simply decided to grow the beard. It was not motivated by fashion or emulation in any way. How did your first beard turn out? From the first days I stopped shaving, I was very surprised looking at my “new face”. The first impression was good and it was appreciated among relatives and work colleagues. Seeing the impression that my beard made on me and those around me, my first thinking was: Why I didn’t grow my beard before? I lost time, shaving myself for years. All men of the world should try it once. Stop shaving the beard and feel the difference. What did it feel like to see yourself with a beard for the first time? I saw myself as very masculine, sensual, and influential. I felt even more self-confident. Have you kept your beard continuously since 2011? Yes, I never thought of shaving it. What do you think of the full beard versus other beard styles? I think that the full beard is more beautiful and masculine. I wanted a big beard and, if you are growing a beard, you might as well grow a real beard and not a cowardly beard. In the first photos that you submitted to beards.org, you had the cheek line very low, with two open areas carved out below the lip on each side. Now you have raised the cheek line considerably and allowed the open areas below the lip to fill in. What led to this considerable transformation of your full beard? Naturally, while shaving, the cheek line was gradually raised unintentionally. Then I saw that I had become much more handsome (LOL). So I decided to keep a full beard with the more natural cheek line. How do you feel about your beard now with the changes you made that are listed in the previous question? I like it. It’s more masculine and I feel much better. I understand your next change for the beard will be to go even more natural with the cheek line. What are your thoughts on that? I think it’s a beautiful thing. I like my natural line. Perhaps I’ll change the beard cheek line just a little, according to the instructions that are on beards.org/cheek.php. Do you trim and shape your beard yourself? Yes, I am pleased to do this alone. If I had a faithful professional barber, I would not rule out a trim from the barber. At the moment, I’m trimming alone. How did you learn to trim and shape your beard yourself? I’m self taught. I think I have an innate skill and fancy to manage the beard. Do your family members, friends, and colleagues like your beard? My wife doesn’t like it very much, even if it says that I am well and even better with a full beard. Friends and work colleagues are divided in half between those who say that I’m better and those who say that I am becoming older. What kinds of reactions to your beard do you get? These reactions are divided equally between men and women. How well is your beard accepted in your workplace? Have you had any problems? It has been accepted very well and I have not had any problems. I am a health professional. As well as with colleagues, I have relationships with external persons and I never had any kind of problem. Indeed, I have felt much more considered and more influential. In my work, relationships are important and the beard, as suitable clothing, helps to communicate. Some men fear that beards do not look professional. What do you say? If a professional has competence, potential, creativity, and passion in the work, he must not be afraid of the beard. On the contrary, the beard can only increase self-confidence and outward recognition. Why do not more men grow beards today? I think it is not possible to generalize. It depends on the culture, fashion, and so on. 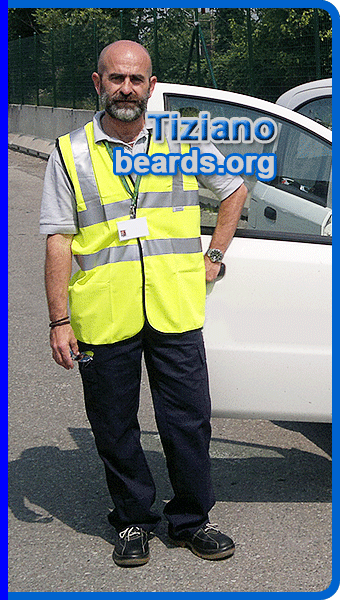 In Italy today, I believe we are increasing the numbers of men who wear the beard. The gauge is soccer players who generally lead the aesthetic choices. What are the advantages of having a beard? Do you take a lot of pride in your beard? Has your beard had any effect on your self-confidence or how you see yourself? Yes, I am better. I feel better and self-confidence has grown. I don’t know why, but it is so. What’s it like having such a great beard as yours? My life has changed a little for the better because I am seen as more interesting. But I think that there is only the magnificent naturalness and pride with which a man carries his beard. It does not matter what beard you have. Grow it and wear it with pride as a part of you. No, only that I would have liked to have grown it earlier. What led you to decide to become a dedicated, permanent beard grower? Seeing the the nice influence that the beard had on others. What are your plans for your beard? To continue to keep it and perhaps to slightly correct the cheek line. What have you learned from your beard-growing experience? In your life you must try and not be afraid and…that you must lubricate the clippers! To your knowledge, has your beard inspired anyone else to grow a beard? Yes, a colleague who currently has a full beard just like mine. Would you recommend to other men who are capable that they grow full beards? How do you feel about being featured on beards.org? What do you think about beards.org? A useful website to anyone who likes or would like to have a beard. 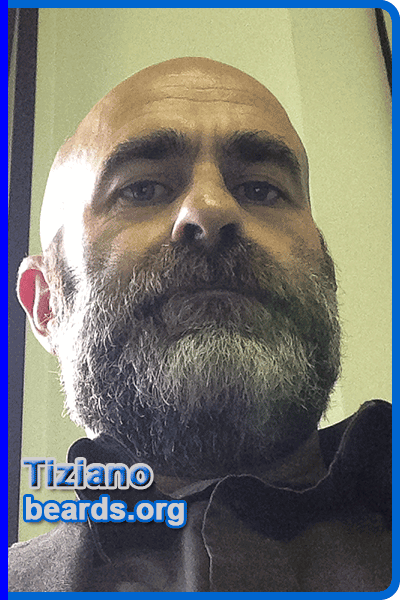 Click on the image below to go to Tiziano’s photo album. One of Tiziano’s favorite cities to visit is New York City. As you can see, he has made quite an impression there!